The combined capital city preliminary clearance rate increased to 70.3 per cent this week, up from last week, when the final results saw the clearance rate fall to 66.5 per cent, the lowest clearance rate since June 2016. Auction clearance rates have been trending lower since reaching a peak at the end of February 2017 when the combined capitals clearance was recorded at 78.4%. Considering the easing trend in clearance rates, as well as the fact that preliminary rates generally revise lower as more results flow through, it will be interesting to see how this week’s preliminary result compares with the final clearance rate which will be published on Thursday. Auction volumes were lower this week with 1,984 homes taken to auction across the combined capital cities, down from 2,355 last week however significantly higher than this time last year when auction volumes were quieter due to the Federal Election when only 841 homes were taken to auction. Melbourne had the highest number of auctions this week, with 866 properties going to market, followed closely by Sydney with 832 homes going under the hammer. Across Melbourne, 71.9 per cent of the 750 reported auctions sold this week. There were 866 auctions held across the city this week, falling from 1,047 last week when the final clearance rate was 70.7 per cent, but much higher than one year ago when just 270 homes went to auction and a clearance rate of 66.7 per cent was recorded. The West region of Melbourne had the highest number of auctions this week (160), with a preliminary clearance rate of 68.8 per cent. Meanwhile, the strongest clearance rate was recorded across the North East, with 80.8 per cent of the 99 reported auctions clearing. In Sydney, 832 properties were taken to auction this week with a preliminary clearance rate of 72.6 per cent, increasing from last week, when the final clearance rate for the city was 68.2 per cent across 939 auctions. One year ago, just 365 Sydney homes were taken to auction and the clearance rate was 78.4 per cent. This week, the performance across Sydney’s individual sub regions was mixed. Across the Outer South West region, where 11 of the 12 results have been reported so far, the preliminary clearance rate was 36.4 per cent, while across the Ryde (89.7 per cent) and Sutherland (84.0 per cent) regions, the success rate of reported auctions was much higher. There were 119 Brisbane homes taken to auction this week, with 77 results reported so far. The preliminary clearance rate for the city is 54.5 per cent, up from 33.3 per cent last week and higher than one year ago, when 35.6 per cent of the 68 properties taken to auction were successful. Across the Gold Coast 39 results have been reported so far, with a success rate of 38.5 per cent. This week, Adelaide saw a preliminary clearance rate of 62.5 per cent, with 56 reported results across a total of 79 scheduled auctions. In comparison, over the previous week Adelaide’s clearance rate was 68.5 per cent and 62.3 per cent one year ago. There were 43 Perth auctions this week and so far 20 results have been reported, with 50.0 per cent selling. 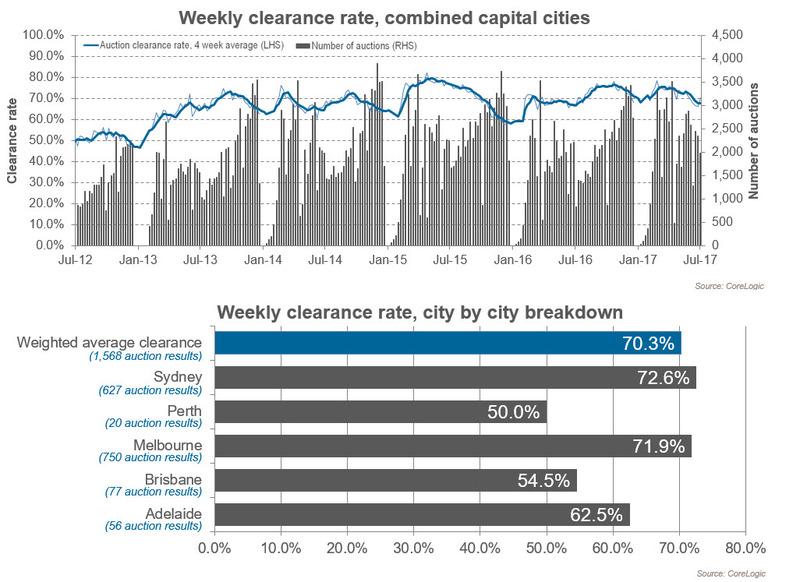 Last week there was a 39.6 per cent clearance rate for Perth. Canberra’s preliminary auction clearance rate of 75.8 per cent across 36 auctions is higher than both last week, when the final auction clearance rate was 67.2 per cent, and last year (54.2 per cent). Tasmania saw 9 auctions take place this week and 5 results have been reported so far, with 3 sales.